When we found this house, it was empty – other than nasty carpet, out-dated appliances and cabinets that were falling off the walls. But there weren’t any “things” here. The house and property had been cleaned out – auctioned off to the bare bones. It was a little sad to realize that I wouldn’t be able to rummage in the attic or basement to find any true “artifacts” of the house. But I was wrong. The house has “coughed up” interesting things when least expected. I spent a hot, sweaty day in the dark attic sweeping clouds of dust down the tiny stairs onto the miserable brown carpet below. I wanted all that dirt out well before any new carpeting made its way into the house. I realize I could have been blinded by the dirt in my eyes, but after sweeping the half of the attic that is about 8 inches taller than the other half, and proclaiming it finished, and looked back across my clean-swept floor boards only to notice something sticking up between the tongue and groove boards. It was an old house key. I guess if the “ghost” of No Rhyme or Reason Farm wanted me to feel welcome – giving me the key to the house is a pretty good sign. To sweep away the dirt on the lower half of the attic, I had to move 26 very old window frames in various stages of disrepair with broken glass and protruding nails. I gingerly moved them from under the eaves, one at a time, until I heard something moving on the floor. After letting out a scream (that thankfully no one heard except me), I realized it was just an old jar rolling towards me – an old blue Mason canning jar in perfect condition. Another nice house warming gift from the old house – given how much I like canning jams, jellies and pickles. The artifacts didn’t stop there. With the excavation, dirt has piled up, settled, moved and shifted — and in that process, I sometimes catch the glint of glass or metal. I feel like an archaeologist brushing away the dirt to reveal old medicine bottles, part of an old iron, or pieces of broken pottery. It seems like when I purposefully inspect one of these piles of excavated dirt, I never see anything. But when I’m not looking – all of a sudden, something is there – pushing through the surface. The most unexpected artifact, however, was being handed the old deed to the property. I had serendipitously met a woman at work whose husband knew this farm and Florence Reason. He was instrumental in selling the property when she passed away, and while cleaning out old papers, they found the deed – the one deeding the property her parents in 1936 for $3000. What are the chances – really, to come in to possession of this old deed, complete with the old tax stamps? I think we’ll frame it. ← September — Walls and Windows and Doors — Oh My! 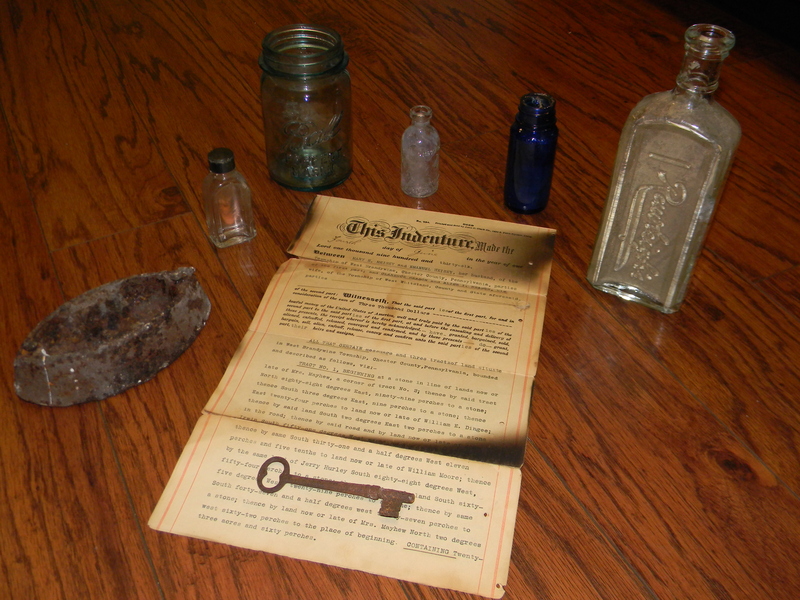 What a wonderful assortment of artifacts: what could be more welcoming than the deed to the property and a key to the house? The ghost also gave to the generous gift of an intact Mason jar to encourage one of your hobbies, a BROKEN iron to thoughtfully suggest that you give up housework and a medicine bottle as a sign of sympathy for the aches and pains you will endure as you bring life back into No Rhyme or Reason Farm. You should feel very welcome and much at home! Perfect artifacts for a warm welcome to your new HOME! You must frame the deed and key. What a beautiful keepsake!! !